We wanted to have a post that was all about Connor's funny personality. He's got a great sense of humor and he's been so much fun lately. He really loves to be surprised and scared, and loves when we hide and jump out at him. He's got such a happy disposition and we really haven't had a problem with the "terrible two's". Connor's usually a very good listener and gets along well with other kids. 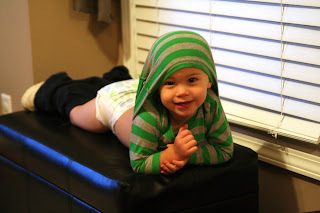 The other night while he was playing with Daddy, Daddy pulled Connor's shirt up over his head and Connor thought it was hilarious. 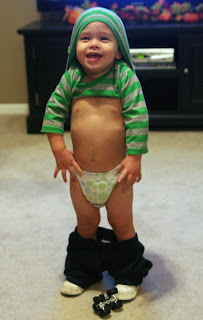 He pulled his pants down and walked around acting silly and we luckily got a few pictures of him. He spontaneously climbed up on the ottoman we keep his toys in and posed for us. We love our silly little guy.